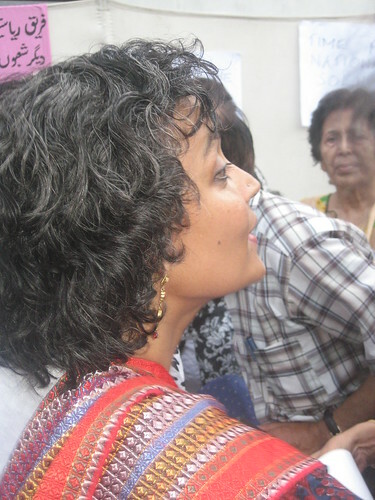 Arundhati Roy , originally uploaded by Noormohammad. Arundhati Roy is a celebrated Indian fiction writer who had made waves across the globe with her novel, “God of small things”; a story that dealt with ‘sensitive’ topics, like race, religion and love. She has, lately, turned into a mammoth social activist using her wit, wisdom and dexterity with words to thrash aspiring “empires”, be that of the US or India. She visited Karachi, last Friday, on the invitation of an NGO. At Karachi press club she attended a program organized by a group of ‘feminist’ NGOs against Talibanization of the country. While speaking she said that her objective of visiting Pakistan was to understand ‘what exactly do you mean when you use the term Taliban”. She cautioned the audience to ‘not simplify what is complex and not complicate what is simple’. Her opposition of the Narmada Valley Dam, a project that had jeopardized life and property of millions of impoverished communities in India, speaks volumes for her objectivity and determination. It is pertinent to note here that her frank statements rebuking the Indian brutalities in Indian occupied Kashmir had irked millions across India, including powerful politicians and opinion leaders.